Meet author Tim Walker this time next week! So excited – here’s a foretaste of the Author’s Mind interview which will appear on my Guest Blogging page in a week’s time! Can you briefly describe the story of Uther’s Destiny? The story begins two years into Uther’s reign in the year 469 AD. He has succeeded his brother, Ambrosius Aurelianus, as high king of the Britons, and his main concern is to protect the boundaries of his kingdom – modern day England and Wales – from barbarian invaders. 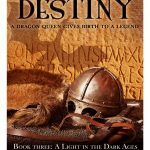 Uther’s destiny as a warrior-king seems set until his world is turned on its head when his desire to possess the beautiful wife of a noble, Ygerne, leads to conflict. Brittle alliances teeter on the brink of collapse as Uther doggedly pursues his quarry, oblivious to other pressing matters of state. Court healer, and schemer, Merlyn, sees an opportunity in Uther’s lustful obsession to fulfill the prophetic visions that guide him. He is encouraged on his mission by druids who wish for a return to ancient ways and urge him on to protect the one destined to save the Britons from invaders and lead them to a time of peace and prosperity. Merlyn must use his wisdom and guile to thwart the machinations of an enemy intent on foiling his plans. Uther is challenged to rise above his domestic problems and raise an army to oppose a gathering Saxon force. In a climactic moment, the two armies meet in a battle that will decide the fate of the island.